Sri City, March 15, 2018:- CETC (India), an ancillary of China Electronics Technology Group Corporation (CETC), hosted a ground breaking ceremony on Thursday, marking the start of construction of its Solar Photovoltaic Cell (PVC) Manufacturing park (phase 1) in Sri City. 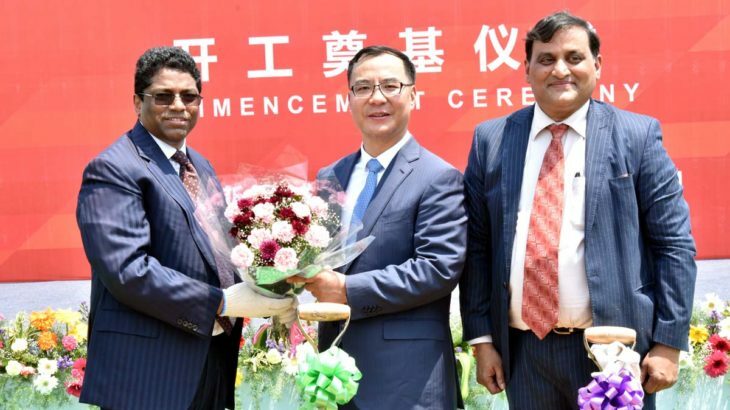 Mr. Liu Liehong, General Manager, CEO, CETC broke the ground and laid the foundation stone along with Mr. J. Krishna Kishore, IRS, Chief Executive Officer, Andhra Pradesh Economic Development Board (APEDB) and Secretary to Govt. of Andhra Pradesh, Mr. Ravindra Sannareddy, Founder Managing Director, Sri City and senior managers of CETC. Stating that among the various sites surveyed by them ‘Sri City was the best’, Mr. Liu Liehong said that the facility will be commissioned with in 18 to 20 months and sought the support of state government in getting all approvals in time.”We look forward fo work hand in hand with Sri City and AP government,” he added. “We are particularly happy because, we are hosting such a project, which may help boost India’s local solar power production capacity and deliver a significant invigoration for achieving the target of 100 Giga Watt of solar PV capacity by 2022,” he added. The plant, which will be built in a plot of 18 acre in the Domestic Tariff Zone (DTZ) at an initial investment of around Rs. 320 crores, will be commissioned by last quarter of 2019. The project would generate employment for 300 people in the first phase and about 1,500 total jobs in a phased manner. The plant will manufacture Solar Photovoltaic Cells. During first phase the plant would be of 200MW capacity. CETC, headquartered in Beijing, is a backbone state-owned enterprise in China. It was officially established in March 1st, 2002. It is made up of 66 secondary member units, 8 listed companies,42 subsidiaries and over 40 offices overseas. There are 150,000 employees, 18 national key laboratories, 10 national research and innovation centres. In 2016, CETC realised its main business revenue of 188 billion yuan, profit of 18.31 billion yuan, and entered the Fortune Global 500. It is the most powerful national central corporation in the fields of defence electronics, security electronics, etc., with the market covering more than 110 countries and regions in the world.